From Last Best Brewing & Distilling in Calgary Alberta comes their second ever bottled beer the “A.E. Cross Barley Wine Barrel Aged” the second of their Lineage Series. This is a 2016 Vintage and has been cellared by the brewery itself until 2018. The beer pours a deep orange brown colour with an off white head. For the second release they split the beer into two versions one unoaked and then this one that was barrel aged for 10 Months in Alberta Rye Whiskey Barrels. The aroma consists of mild oak, dark fruits, stone fruit, brown sugar, caramel, toffee and rye. The flavour is of oak, dark fruits, cherry, toffee, caramel, grapefruit rind, honey, resin, rye spice, rye whiskey, bitterness and alcohol. The alcohol content comes in at 11.8% with an IBU of 45. This is a borderline American Barelywine and really enjoyable. I hope they make more of this in the future. Commercial Description: With our 2nd lineage release, we pay homage to a prairie legend with our riff on a classic style. The Alfred Ernest Goss Barley Wine uses locally sourced barley wheat, and rye as a fitting tribute to the founder of Calgary Brewing & Malting and the embodiment of the Last Best West. We split this release into two: one unoaked and one aged for 10 months in 100% Alberta rye whiskey barrels Layered with subtle, integrated oak and a developing rye spiciness, this beer is characterized by its sweet caramel and barley malt base alcohol warmth, hints of dark fruit and a touch of light malted wheat Serve it at cellar temperature and age for years to come. From Mike Hess Brewing in San Diego California comes their “Habitus Double IPA”. The beer pours a copper colour with a tan head. 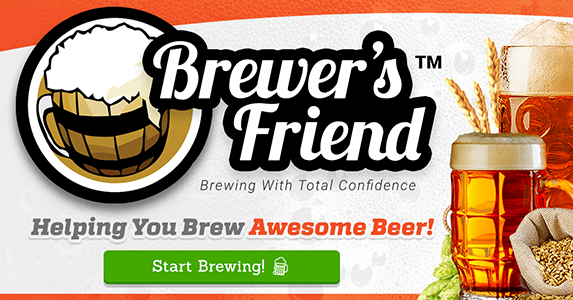 The aroma consists of tropical fruit, citrus, rye spice, herbal hops with a floral finish. The flavour is of rye spice, pine, resin, citrus, tropical fruit, orange peel, bready malts, earth and bitterness. The alcohol content comes in at 8% with an IBU of 100. I always enjoy a good Rye IPA and this one does not disappoint at all. Commercial Description: Habitus, winner of the 2014 World Beer Cup℠ in the Rye category, is a spicy, crisp, and extremely drinkable double IPA. We use loads of Sterling and Chinook hops in the kettle and hopback (and even more during the dry hop) for intense pine aromatics accentuated by a rye and 2-row malt base for a truly great IPA experience. 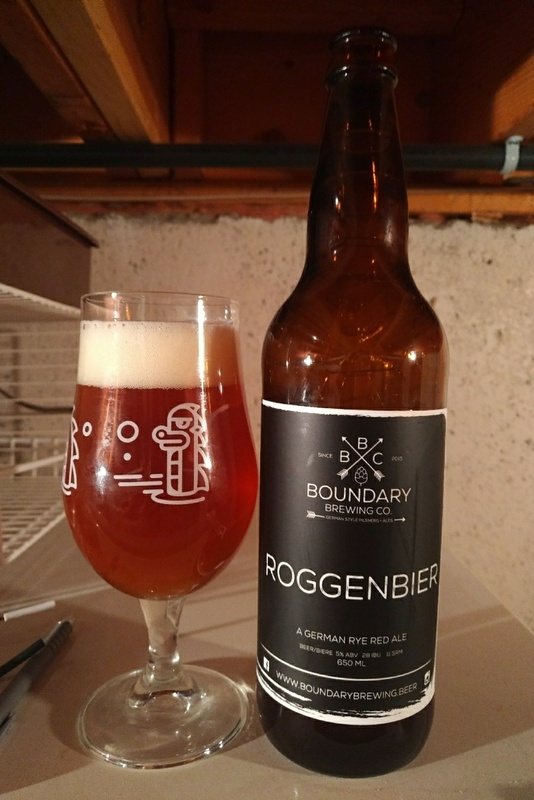 From Boundary Brewing in Kelowna comes their “Roggenbier” a German style Red Rye Ale. The beer pours a copper colour with an off white head. The aroma consists of rye spice, bready malts, grain, fruity esters with some pronounced citrus. The flavour is of rye spice, bread, grain, citrus, citrus rind, fruity esters, yeast, herbal hops and mild bitterness. The alcohol contnet comes in at 5% with an IBU of 28. I have not had a ton of beers in this style but I can say that I quite enjoyed this one. Commercial Description: A medium bodied German Rye Red Ale. This beer puts the rye malt forward, showcasing the delicate spicyness of the grain, with hints of caramel and roasted barley and perfectly balanced with a delicate herbal hops finish. From Bomber Brewing in Vancouver in collaboration with Sawdust City Brewing Co out of Gravenhurst Ontario comes their “Spicy Nuggs Imperial Rye Stout”. The beer pours an opaque black with a brown head. The aroma consists of roasted malts, smoke, ash, earth, rye, chocolate, anise and a hint of hops. The flavour is of roasted malts, smoke, ash, earth, chocolate, anise, big rye spice, chipotle pepper and hops bitterness. The alcohol content comes in at 9% with an IBU of 70. While I usually don’t really enjoy spiced beer I saw some real potential in this one and all of that potential and more was realized and more! This beer is an awesome mixture of flavour. Commercial Description: Forged in the fiery furnaces of a new-found friendship, Spicy Nuggs Imperial Rye Stout is a festival of flavours and one F’n good collaboration. Ridiculous measures of roasted and rye malts lay the base, while spicy nugget hop hash and smoky chipotle pepper bring the heat to this massive inter-provincial ale. From Dogwood Brewing in collaboration with Callister Brewing comes their “Mating Saison”. The beer pours a cloudy orange colour with a white head. The aroma consists of rye spice, rye, grainy malts, fruity, yeast and floral hops. The flavour is of rye, rye spice, grain, resin, grapefruit rind, earth, yeast, herbal and some bitterness. This is a fairly dry beer. The alcohol content comes in at 4.6% with an IBU of 20. I am always a fan of a good collaboration beer and this one is no different. If you like a good saison you should take a look for this one. Commercial Description: The perfect marriage between two breweries saw the birth of this refreshing Rye Saison. Brewed with organic Azacca hops, all organic malt and lots of tender love… this subtly spicy saison ends with a tropical fruit finish that’s patio perfect and sure to please. ’Tis the season stags and stagettes, so go get your rut on.